Creating quality footwear has been our passion since 1935 when we created the world’s first boat shoe. Now Sperry creates sea-worthy sandals, comfortable dress shoes and performance boat shoes that blend naturally with mainland fashion. Our founder, Paul Sperry, was an avid sailor with a passion for adventure. He was faced with a real-life problem that stood in the way of his passion: How to maintain traction on a slippery boat deck. Paul found his inspiration from his dog Prince. Noticing how he didn’t slip on ice, he turned Prince’s paw over to ﬁnd hundreds of small cracks and lines going in all directions. These became the inspiration behind his inventive non-slip sole and the world’s ﬁrst boat shoe. 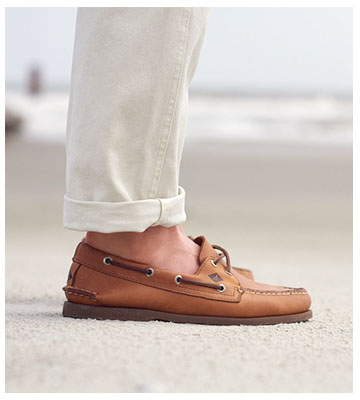 Every single member of the Cruising Club of America wrote to Mr. Sperry to request a pair of these remarkable new boat shoes. Nothing else kept sailors safe on deck. During World War II, the US War Department named Sperry Top-Sider as one of the official shoes of the US Navy. 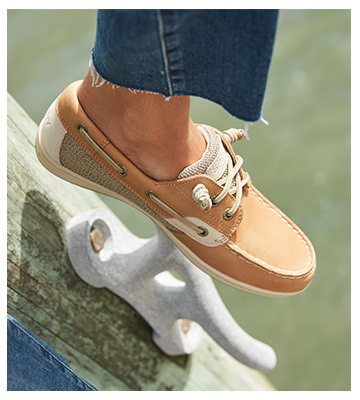 From the world's first boat shoe to today's contemporary styles that remain true to our heritage, Sperry exists for those drawn to the sun, surf and soul of the ocean.